The reason for using melted butter instead of creamed butter in a cookie is to release the small amount of water in the butter into the flour quickly. This helps develop the flour’s gluten and gives a chewier rather than crispy texture to the cookie. 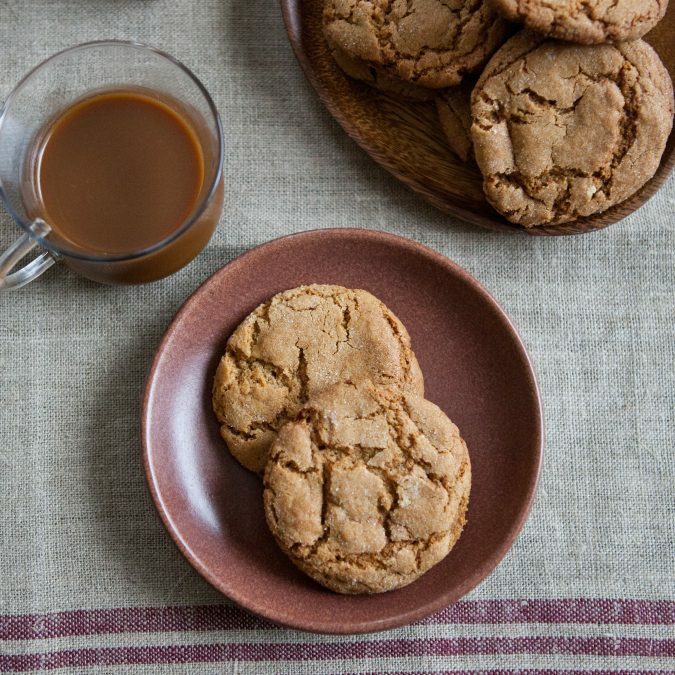 This technique works perfectly with einkorn flour, since the flour is slower to absorb fats, and the wonderfully soft texture of these ginger cookies is proof of that. The cookies come out of the oven really soft and although they might look underbaked, they set up perfectly after cooling. 2. In a medium bowl, stir together the flour, baking soda, and salt. 3. In a second bowl, stir together the butter, the 1⁄2 cup granulated sugar, the brown sugar, molasses, ginger, and cinnamon. Add the egg and whisk together until well combined. Add the flour mixture and mix with a spatula until the dry ingredients are no longer visible. Let stand for 15 minutes to give the flour time to absorb the wet ingredients. 4. Spread the remaining 3 tablespoons granulated sugar on a small plate. Roll 1 1/2-inch (45 g) balls of dough between your hands and roll them in the sugar to dust completely. 5. Place the balls 2 inches apart on an ungreased baking sheet. Bake for 16 minutes until the cookies have spread and are barely firm to the touch. Let the cookies cool on the baking sheet for 10 minutes, then transfer to a rack to cool completely. The cookies can be stored in an airtight container for up to 3 days.